Moments after I posted some articles about adding Picasa slideshows to websites, a rogue blogger stole my content and posted it VERBATIM to his own blog. I am certain that this was an automated attack and that it was nothing personal. (It was too fast to be otherwise.) I checked some of the other posts on his blog and they all originated from other people’s wordpress.com blogs. I reported the site to the host and I am now waiting for their response. If this kind of thing happens to you, have a look at this article: How to Deal with Online Plagiarism: When People Copy your Blog Articles Without Permission. This entry was posted in How To, Web Design on August 16, 2008 by Shaney. As an addendum to the post that I just wrote about adding a slideshow to your website, I would like to add some more information about adding a Picasa slideshow to a site that is hosted on http://www.wordpress.com. See the VodPod Blog for instructions on how to get around this problem. This entry was posted in How To, Photography, Software, Web Design on August 16, 2008 by Shaney. One of my friends asked me how to add a slideshow like the one above to a website. Here is what I told her. 1. Get a gmail account (http://www.gmail.com) if you don’t already have one. If you think that you will do this often for the particular website, make the name of the account something to do with the website rather than something to do with you personally (if the website is not about you). 2. Download Picasa (http://picasa.google.com/) and install if you don’t already have it. 3. Let Picasa search your computer for photos and import them. When it is finished importing them, find the photos you want to make into a slideshow. 4. Select the photos that you want to put into the slide show and upload them to a “web album” from inside Picasa. Do this by selecting the photos and then clicking on the “Web Album” button at the bottom of the Picasa interface. You can select all photos in an album by clicking on the album and pressing Control+A. You can select individual photos by holding down the Control key as you select them. A blue frame will appear around the ones that you select. 5. Once your photos are online, go to the web album to see them. 6. On the left side of the album, there will be a link to “embed slideshow”. Click on it and then copy the code and paste it into your website. I am not sure if I have covered all of the steps in enough detail for everyone to follow. If not, please let me know in the comments where I left you hanging and I will try to give you more guidance. …are going to protect us if anything happens to Japan. That is the website of the Ibaraki section of the Japan Self-Defense Forces. Do they have any idea what an awful impression they are giving people with that site? I mean, it is almost physically painful for me to look at it. None of the colours match, I have no idea where to focus my attention, and they really need to put a warning on the site that it may cause seizures. It looks like it was made by a hyperactive child, not a military organization. There must be some internet policing organization where I can report such atrocities against the Information Age. This entry was posted in Web Design on November 26, 2007 by Shaney. One of the problems with designing websites is that there so many internet browsers available, it is really hard to make sure that your site looks the same in all of them. Generally, if your site is well-designed, it should at least “work” in most of them, but even that is not guaranteed. 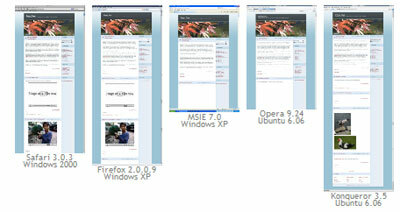 I usually try to test my websites in whatever version of Firefox, Internet Explorer, Netscape, and Opera I have on my computer (which is usually the latest version), but even that is not enough, because there are a lot of people out there who don’t bother (or don’t know how) to upgrade their browsers, people who use different operating systems (Mac, Linux, or even different iterations of Windows), and people whose computers just don’t have enough juice to run some of the fancy-schmancy websites out there. Unless you have a team of people with an array of computers with various operating systems and browsers, it can be rather difficult to test your website under a variety of conditions. One site that helps to make your life (as an amateur web designer) easier is Browser Shots. If you enter your website’s URL into the box at the top of the page, the site will create an image of your site in the various browsers and operating systems that you choose in the section below the box. It can take a while for the images to be formed, so you can go and browse other sites (in the same browser, if you have tabbed browsing — and if you don’t have tabbed browsing, you should — or in a separate browser that you open). sites give you to embed their videos isn’t always coded nicely. Doing this still doesn’t guarantee that your site will work on every single computer in the world, but it will certainly get you closer to that goal. This entry was posted in Web Design on November 25, 2007 by Shaney.